Mr. Muraye, an American missionary, first started the teaching of Geography with History in the College before its post and undergraduate status of the College was transferred to the Allahabad University after passing of the Allahabad University Reorganisation Act 1921. Mr. V. N. Ojha continued the teaching of geography and history at Ewing Christian University College (now William Holland Hall University College) in seminars. 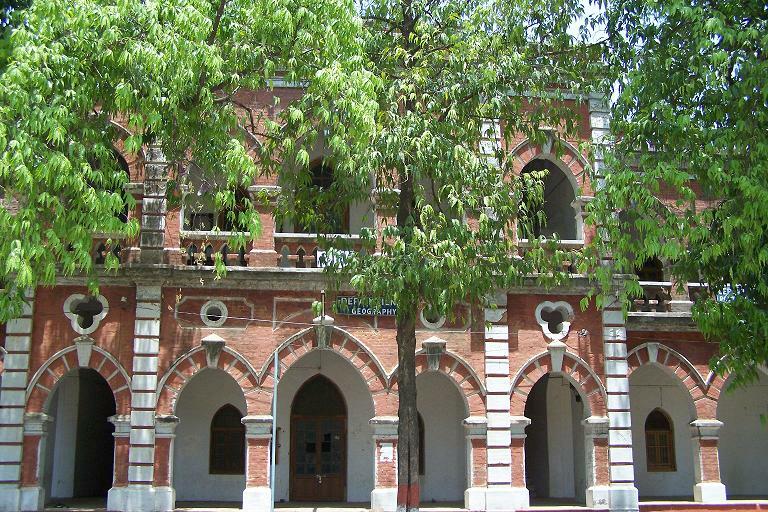 After the restoration of its degree college status, regular teaching of geography at degree level resumed in 1956. Mr. D. Nathaniel was appointed the first lecturer in geography. Mr. Dyalchand took over from Mr. Nathaniel when he went abroad. During the regime of Mr. Dyalchand, the department achieved much of its glory. The first map of the college campus was prepared under his supervision. After Mr. Dyalchand left for U. S., Mr. E. A. R. Austin and Mr. H. R. Mall continued the traditions set earlier. Mr. Austin was the first Head of the Department when the College attained the autonomous status. The present faculty took over from Mr. Mall and Mr. Austin in 1998 and 1999 respectively. The Choice Based Credit System courses of geography being taught in the college have been designed as dualobjective courses to enable students to pursue job oriented courses after graduation, in mapping sciences and different areas related to physical environment, which have a high market value as well for higher studies in courses of greater sophistication. In addition to being a foundation course for the above two, these courses adequately cover the requirements of the course in General Studies papers in different competitive Examinations. These dualobjective courses are intended to provide both education and training by combining a series of lectures, which are designed to communicate fundamental theoretical concepts and principles with an equal, or greater, number of laboratory sessions that focus on the acquisition, development and application of specific technical skills related to geography in general and to Cartography and Environmental Geography in particular. Qualification : M. A., D. Phil.